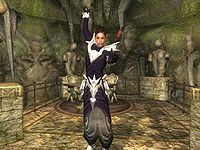 Syl is the Bosmer Duchess of Dementia, and plays an important part in the Main Quest. She resides in the House of Dementia in the New Sheoth Palace District. Syl is extremely paranoid of everyone and everything. Her paranoia is somewhat justified, as you are to stop a conspiracy against her during The Lady of Paranoia quest. The only person she truly trusts, other than herself perhaps, is Lord Sheogorath himself. It is rumored she's had an affair with her counterpart: the Duke of Mania, Thadon. Syl wears a unique and unlootable dress. Due to her mental condition, she lives a rather lonely and isolated existence inside the House of Dementia, with only her regular staff to keep her company. She sleeps behind locked doors in her quarters every night between midnight and 6am, guarded by her faithful Dark Seducers. After waking up, she enjoys a two-hour breakfast and then walks through the Private Gardens to her throne where she will hold court until 2pm. She will then head to the dungeons for a bit of comfortable wandering near her prisoners. At 12am, she will head back to her quarters and go to bed. Once you initiate the Lady of Paranoia quest, she will skip the dungeon trip and stay near her throne until midnight. Before the quest she will angrily greet you: "What do you want?". She won't provide any information but a daily rumor, provided her disposition towards you is 30 or above. There are several exceptions to her daily routine. See the Quest-Specific Events section for details. 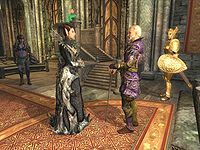 When initiating the quest The Lady of Paranoia, Sheogorath will provide a description of the paranoid Duchess: "The Duchess of Dementia. Ever wary, ever worried. A prisoner in her own House, in a way. And a delightful conversationalist, really." The only people involved in her isolated life are her courtier Anya Herrick, her steward Kithlan, and sadistic dungeon keeper Herdir. Almost matching Syl's state of paranoia Anya Herrick will provide a bit of info: "I'm Anya Herrick. I serve Lady Syl, and she allows me to remain protected within the House of Dementia. I'm so grateful to her." With a disposition under 65, Kithlan will confirm Syl's nature to hide: "You wish to see Lady Syl, do you? The Lady has refused any and all appointments of late. You'd have to try and find her on your own, and I don't recommend that course of action." Kithlan may tell you with a disposition of 65 or higher: "I can tell you that while she stays out of the public eye these days, she does still hold audience in her court during the day. You may attempt to approach her then. The Lady has been concerned about her safety lately, so be prepared for a hostile reaction." Finally, summoning Haskill will net you: "Her Ladyship is rather suspicious of all around her. Best for you to not question it, and merely do what she requires of you." The supposed affair between Syl and Thadon plays a big part of this quest. When explaining what must be done during Addiction, Thadon himself will hint at the supposed affair: "We hold on to fleeting things even as we slip. I knew, and yet I indulged myself anyway. I indulged her a fair bit, too. Hee hee! It was passion, it was... forbidden. Oh, the things that would be said if word got out. That made it all the more delicious. From Dementia's own court, no less. Scandalous! Fatal, perhaps. But passion makes no accomodation [sic] for self-preservation." When you approach Syl, she will coldly greet you: "Why do you approach the Duchess of Dementia? Do you seek death?" You can simply excuse yourself, which won't do you much good: "Leave here at once. You've no business being here!" Or you can tell her you were told to find her, and she will get straight to the point: "You're the one the Madgod sent, aren't you? Then you're safe for now. Speak to no one unless I instruct you to. None of them can be trusted. Do you hear me? None! Surrounded by traitors and spies, I am. Always, always. They watch and wait, eager to slip a knife into my spine when I'm not looking." "Could be all of them. Every last one. None can be trusted. But they'll never take me down. Never! I'll see them all rotting in shallow graves before I let my guard down! You... you will help me. Yes, yes. You will be most useful." "Why not just have them all killed?" "That's exactly what they'd be expecting. They'll have replacements lined up, and then there could be even more of them surrounding me. No, no. Too easy a fate for them. That's why you're going to help me. You're going to find them, force their hands. Put them to the screws." You can either tell her you don't want to help her, which will make her threaten you: "No? Have you seen my torture chamber? Because that's where you'll wind up if you don't agree to assist me. Think on it." Or you can ask her how you can help, after which she will appoint you Grand Inquisitor: "You're going to find out who knows. You're going to learn who keeps secrets, who conspires against me. You will be my Grand Inquisitor. Expose the conspirators, and they will be punished, I assure you. Find out who keeps secrets, and what they are. Speak with Herdir. He will help you. Do you understand what is required of you? If no one is found, you will be held responsible." Should you have refused to help, she will greet you assuming you're ready to help this time: "I trust you have reconsidered your position. Are you now ready to help me? ", leaving you with the same two options. After having agreed to help, you can ask her about the conspiracy again: "Find those who plot against me. Bring them to me so I might make an example of them." After this conversation, Syl will cancel her 2pm appointment in Herdir's basement and will instead wander around near her throne, eagerly awaiting results from you. From his spot in the torture chamber, Herdir will agree to help you, and will comment on The Duchess' paranoia: "I don't expect we'll learn much. While I have the utmost respect for her Ladyship, she is well known for being... overly cautious. We must carry out her wishes, however. And I, for one, am looking forward to, ahh... interacting with the citizens of Crucible." 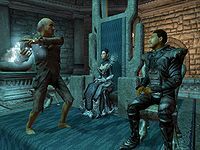 After torturing Anya Herrick it becomes apparent that Syl's paranoia may be justified: "Ma'zaddha came to me, said that Syl needed to be removed, and that I was supposed to help them, or else. I would be far too afraid to turn on Syl. But I couldn't turn them in, either, because they might come after me. Please, you must do something!" Your next target is Ma'zaddha. When you listen in on his conversation with Nelrene at night, it becomes apparent that certain Crucible citizens are very unhappy with Syl's secret meetings with The Duke of Mania: "I want to see Syl dead just as much as you do. She cannot be allowed to survive, after what she's done. It's despicable." When you confront him about it in person and you ask him why he wants Syl dead, he will explain: "You don't know, do you? She's kept it a secret even from you! She and Thadon... they've been meeting in secret. They've been doing things together. Consorting. You understand me? It cannot be permitted! She must be stopped!" At this point, if you confront Thadon about the conspiracy, all he will say is: "Oh, no. You'll not drag me into Syl's mess. She made this bed, now it's up to her to burn it." When you can get Nelrene to confess, she'll tell you: "I am part of the group that wishes to see Syl drowned in a pool of her own blood." When you finally find out Muurine is the leader of the group, confronting her with evidence will make her confess: "Yes, I orchestrated it. Syl deserves to die a painful death for turning on all of us, and consorting with our enemies." This will cause Haskill to say: "Lady Syl will be quite pleased to hear that her concerns have been proven valid. You shouldn't keep her waiting." When you go report Muurine's confession, Syl will ask you about it as she greets you: "What news do you have to report, Inquisitor? Have you found who is responsible?" When you tell about Muurine, she will tell you to what to do next: "Is that so? I shall have her brought to the torture chamber at once. Meet me there shortly." Trying to talk to her as she travels to the torture chamber will be to no avail: "We shall speak when we've reached the chamber." During your trip to the torture chamber, Haskill will comment: "What more is there to say, Inquisitor? Lady Syl has her moment of glory. Allow her to bask in it." Once you are there, she will be straight to the point when confronting the now imprisoned Muurine: "You've confessed to attempting to kill me, I understand. The penalty for this treachery is death, and is to be carried out immediately." She will then push the button next to the cell which will cause a deadly electrocution on Muurine. She will then confront you and reward you: "You see now what happens when those who oppose me fail, which they always do. I am pleased with your work, Inquisitor. As a token of my appreciation, I shall spare your life, and make you a Courtier of Dementia. In addition, accept this Bow. May your enemies fear you and never know from where or with what enchantment you shall strike." The bow she'll give you is an enchanted Dark Bow called Ruin's Edge. When you choose to become the Duke/Duchess of Dementia, you're going to have to get rid of Syl. The Ritual of Dementia requires you to bring her heart to the Sacellum, a task which will not be easy to complete. Sheogorath himself will tell you: "A dangerous choice. I like it! She's gotten to be a bit much, anyway. Thinks everyone is out to get her. Which they are, in this case. So be it." He will add more information about her, should you ask it: "Syl is as crafty as she is beautiful. I'd watch my back if I were you. Oh, this is so much fun!" When you go to the House of Dementia, you'll find out she's not there. Citizens of New Sheoth may tell you what they know about Syl: "All I can tell you is Syl is rarely seen in public, and her staff takes care of the day-to-day activities. I'd check with Anya Herrick, her Courtier, and Kithlan, her Steward. Maybe they can help you." They may also tell you about Anya: "I hear that in light of recent events at the palace, Anya Herrick is more loyal to Syl than ever. In fact, she rarely leaves her side! ", and Kithlan: "Well, I've heard that recent events in Syl's court have made Kithlan a bit disillusioned with its leadership. But you didn't hear that from me." When you confront Anya Herrick about Syl, she will tell you: "She is staying well out of sight. No need to take unnecessary risks. I maintain a close watch on her. 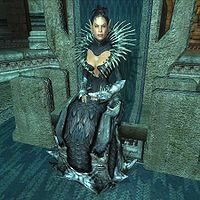 She fears that Sheogorath no longer favors her presence and wants her replaced." If you tell her you need to replace her with a disposition lower than 60, she will tell you: "Ha! You're mad! Syl has yet to be bested in any combat! Unless... well, if you think you have a chance. How do I know this isn't some sort of trick?" Only with a disposition of 60 or higher will she help you out: "Perhaps I've misjudged you. Alright. I'll help. Just remember me when you take over her position. What can I do to help you?" When you tell her you need to get close to her, she will propose to distract the guards: "Well, the best I can offer is help with the guards. I can distract at least two of them and get them to leave her wing of the palace. That should help you to get in there a bit easier." When you confront Kithlan about Syl, he will tell you: "I suppose I should be grateful working in the palace with her, but I can't stand having to constantly look over my shoulder. I don't know if she has it in for me or not. I think she is in constant fear of being replaced." When you tell him you need to replace her with a disposition under 60, he won't trust you: "No! I cannot even think such thoughts. How do I know I can trust you won't become just as tyrannical as she has?" Only with a disposition of 60 or higher will he offer his help: "Yes, I see you may have what it takes to replace her. Very well, what is it you need from me?" If you ask him if he can get you close to her, he will tell you: "Hmmm. That may be difficult. Syl has been hidden from public sight lately. However, I can give you something that may help. Take this key. It should unlock any door in her wing of the palace. You still need to be wary of her Seducer guards, but it should help." When you finally reach her quarters, you'll see a body lying on the bed. At closer examination, you'll find out it's Syl's double, and that you have been tricked. Kithlan will run up to you: "Don't be fooled, the Ritual isn't over. 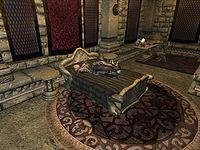 The body on the bed isn't Syl, but merely an impersonator. The real Syl uses many such decoys to throw would-be killers off her trail. Syl has made her escape through the hidden tunnel in the gardens outside her quarters! She must not get away! Be wary, I fear that her escape may be a ruse to lure you into an ambush." He will then show you the hidden tunnel which leads to Xirethard. Summoning Haskill at this point will give the following hint: "Now that you've found Syl's escape route I'd tread very carefully. She is the Mistress of Deception after all. If she means to escape, she'll do everything in her power to stop you." "Dementia will never be yours!" "How dare you try and best me!" "I'll feed on your entrails for dinner!" "I've slain Grummites tougher than you!" "You'll be but another notch in my hammer!" "I'll have your head on a spike!" "Ugh! Darkness, give me strength!" "Argh! I'll fight you to the death!" When you've finally killed her, all you have to do is take her heart and find your way out. Syl: "Wait! I must speak! The Ritual must not be completed!" Sheogorath: "Syl! How dare you interrupt me! Only I interrupt me. Like just then. I'm speaking with someone. We'll talk later. Or not. When is later, exactly? Not now, I'm sure of that. 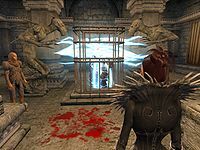 Guards, I think Syl forgot how to use the door. Kindly show her out. Before I forget myself." "Thadon... dead? You've done this. It was you all along!" "Hold your tongue, little Duchess, or I'll tear it from your mouth." "Replacing Thadon with this... outsider? This is how it ends. I should have seen this coming." "Calm yourself, Syl. You're making my teeth itch. You still hold your office. I suggest you see to your duties." "No! I see what's going on. I should have seen it before. You conspire to destroy us all! You're a fool if you think I'll allow this to happen." "Fool? Visionary! Change is in the air, Syl. Breathe it deep! Bathe in its scent! Bottle it up. Save some for later." "Order stands at our door. They've taken the Fringe! Did you even know? Do you care? And you speak of "change"?" "No. I can't do this. There has to be a way out. A way to escape." "Then go, Syl. Return to your quarters. Before I send you back in pieces." "Yes! That's what I'll do. I'll go. The enemy of my enemy. Order is the key. I'll keep them close." "This is not over, Madgod. I give myself to Jyggalag. As a Priest of Order, I'll be safe. Your empire will crumble before the armies of Order." After the dispute, Syl will leave the Sacellum and the Madgod will comment: "Wondering why I let her go, aren't you? I can see it in your face. Mostly in the eyes. I may take those from you when this is done. This has never happened before! The ruler of Dementia turning traitor? Unprecedented! I've seen others defect, but never a Duke! Maybe we're on to something here. We'll see how it plays out. It can't be worse than what's happened before." She will then be disabled and removed from all of her factions. "Our own Duchess, aligned with the forces of Order? An infuriating thought! 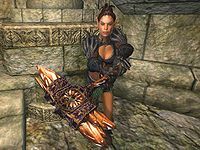 She will suffer greatly at the hands of Lord Sheogorath." - Adeo after releasing Dylora. When you return to the Palace after Symbols of Office, starting The Roots of Madness quest, you will find the Font of Madness contaminated. Haskill will explain: "Somehow the forces of Order have poisoned the Pools of Mania and Dementia that feed the Font. I suspect the traitor Syl. Jyggalag has never had an original thought in his existence." You'll find Syl helping Priests of Order contaminate either the Pool of Mania or the Pool of Dementia; she will be found in the second pool you cleanse. As she is now added to the Forces of Order, she will be wearing an Order Priest's Robe this time, and will be armed with her warhammer, Nerveshatter. If you see fit to summon Haskill within range of Syl and ask him about The Fountainhead, he will propose the following: "If I'm not mistaken, that's the traitor Syl. Right there. I'm not normally a bloodthirsty man, but I wonder if killing her might be a good idea?" As Syl sees you, she may continue her contamination, and give the following speech as the other Priests of Order attack you: "I hoped you would come. Now you shall pay for my brother's death." "So, the bloody-handed Duke/Duchess comes to claim another victim!" "You may find me rather harder to kill than poor, innocent Thadon." "To think that I trusted you. You!" "Sheogorath's pet. That used to be me, so blinded by my suspicions that I could not see the truth of my own situation." "If only I had seen it sooner. Thadon might stand here next to me, to help usher in the rule of Order to this benighted realm!" "Instead, he is dead, at your hand. And Sheogorath's command!" "What harm had he ever done to you? The means justify the ends, is that it?" "Then you will appreciate my new master's methods." "None too soon. We have lived too long as the playthings of the Madgod." If you manage to talk to her, be it through using a Charm spell or through a high Sneak skill, she will show some more devotion towards Jyggalag as you talk to her: "Why did you come here? Why do you still do the bidding of that prattling fool? When I swore allegiance to Jyggalag, my eyes were opened. I saw who my true enemies were for the first time. Order's time has come. The Greymarch is upon you." She will attack you after this exchange, however. Rumor has it there's another adventurer trying to get into the Realm. One more person to take up arms against me! The Gatekeeper's been killed. This is only the first step; they'll be coming for me next. Lord Sheogorath would do well to stop bothering with the Resonator, and just send everyone away. Thadon and his Chalice can both rot in Hell, for all I care. The conspiracy has been discovered and eliminated. That is all you need know. The Torch burns again. This can't bode well. Syl also appears in the story expansion Isle of Madness for Legends as the card Syl, Duchess of Dementia.